Texting while driving is the cause of a growing number of auto accidents throughout the United States. Texting causes distraction, and according to the Centers for Disease Control and Prevention, every day in this country 8 people are killed and 1,161 are injured in crashes involving a distracted driver. The CDC describes three basic types of distraction for drivers: taking your eyes off the road, taking your hands off the wheel and taking your mind off the process of driving. 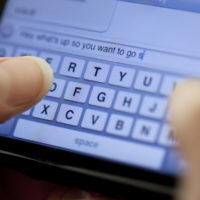 Texting effectively encapsulates all three of these types of distraction, in that a driver must take at least one hand off the wheel and his eyes off the road to read or send a text message, as well as directing his thoughts to the text and away from driving a heavy, potentially deadly machine. If you or a loved one has been involved in a crash at the hands of a texting driver, you may be able to recover damages based on that driver’s negligence. Give police the authority to stop vehicles and give tickets as a secondary offense to persons texting and driving. The law declares texting while driving to be a noncriminal, nonmoving traffic violation. The fact that it is a “secondary offense” means that a police officer cannot stop a driver simply for texting unless that driver commits another violation, such as failing to stop at a stop sign. Causing an accident while texting and driving can also lead to civil liability. An individual who texts and drives makes a choice to violate the standard of care to which reasonable drivers must adhere. Reports note For example, a Florida woman who suffered brain damage in an accident caused by her boyfriend’s running a stop sign while texting and driving received a $4.6 million jury verdict. The third party aided and abetted the driver’s violation of motor vehicle law. As in Florida, texting and driving is illegal in Pennsylvania. However, in contrast to Florida’s law, Pennsylvania treats the offense as a primary one, subject to a $50 fine. The experienced car accident lawyers of Lesser, Lesser, Landy & Smith, PLLC, have represented clients in car accident cases in West Palm Beach, Boca Raton, Stuart and throughout Florida for nearly 90 years. If you have been in an accident caused by another driver’s negligence, contact us for a consultation about your case.